Can both my SIMs do data? Both card slots accept SIM cards with data connectivity. At any one time, only one SIM can support 3G mobile data (as well as Phone & SMS) while other can support 2G (GSM) data connectivity (as well as Phone & SMS). How do I choose a specific SIM card to use for 3G data connection? Your GoFone should now connect to the chosen 3G network if you are in range. Please note that you will likely be charged by your network provider for any data downloaded over Mobile Data (3G) unless you have a data package in your contract. Its therefore best to use Wi-Fi where possible, as its usually quicker and cheaper (or sometimes free). Please Note. Data connectivity (Mobile Data or Wi-Fi data) are not included with your GoFone, unless otherwise stated. Dual-standby means both SIM cards are active to receive calls and text messages. 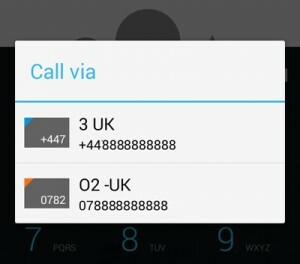 When you’re using SIM 1 and another person is calling on SIM 2, they will hear the message “the person you are calling is currently unavalable” (depending on your network the message will be different) and the call will go to voicemail. How do I know the signal strengths of the 2 mobile networks? When you insert 2 SIM cards into your GoFone, you’ll see 2 signal bars on the notification panel. The first one is for the SIM slot 1, and the second one is for the SIM slot 2 as shown on the inside of your GoFone. How do I select which SIM card to use when making a call/sending a message? You can set the GoFone to default to one of your SIM cards if you mainly use one. Of alternatively you can set to “Always ask” which lets you can choose which SIM card you want to use to make a call or send a SMS Text Message. Your GoFone will ask you this the first time you make a call or send a text message. You can always change your preference at Settings > SIM Management. How do I edit the display name of both the SIM cards? On your phone, go to Settings > General settings > SIM management. Tap the SIM card you want to change the display name. Tap Edit SIM name to change the display name.